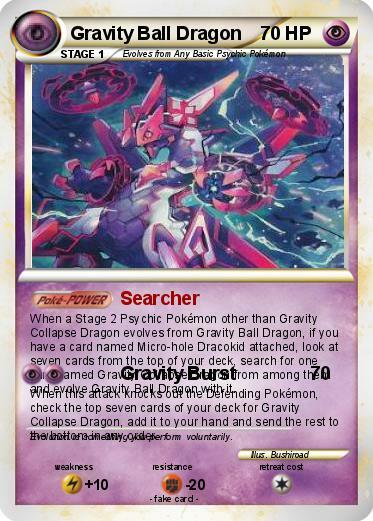 When a Stage 2 Psychic Pokémon other than Gravity Collapse Dragon evolves from Gravity Ball Dragon, if you have a card named Micro-hole Dracokid attached, look at seven cards from the top of your deck, search for one card named Gravity Collapse Dragon from among them and evolve Gravity Ball Dragon with it. When this attack knocks out the Defending Pokémon, check the top seven cards of your deck for Gravity Collapse Dragon, add it to your hand and send the rest to the bottom in any order. Comments : Evolution is something you perform voluntarily.